So we met the Tokyo in-laws halfway for New Years, in Hawaii. 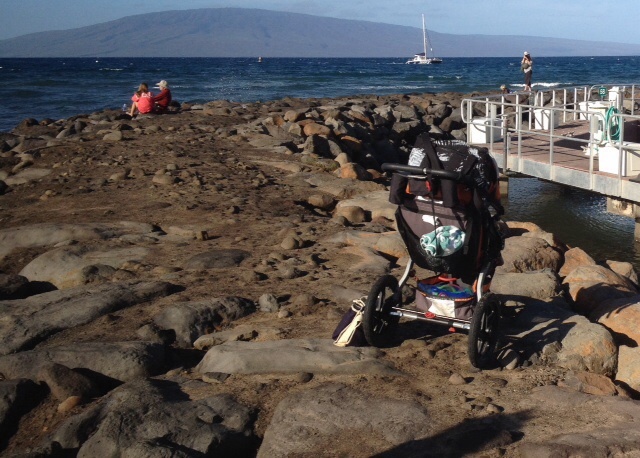 During the kids' surfing lessons in Lahaina this morning, I snapped this BOB Revolution stroller on the breakwater. The dad of two was there taking surfing photos with one kid in a sling and the other crawling free, so free I thought they were locals. Vancouver, actually, where the Revolution rolls as easily through the snow as it does beach sand and lava boulders. And it's held up great through the second kid, too. Just one persuasive datapoint for you.